MV FeBrina offers a number of different itineraries between 8 and 12 nights in Kimbe Bay, the south coast of New Britain and Milne Bay. 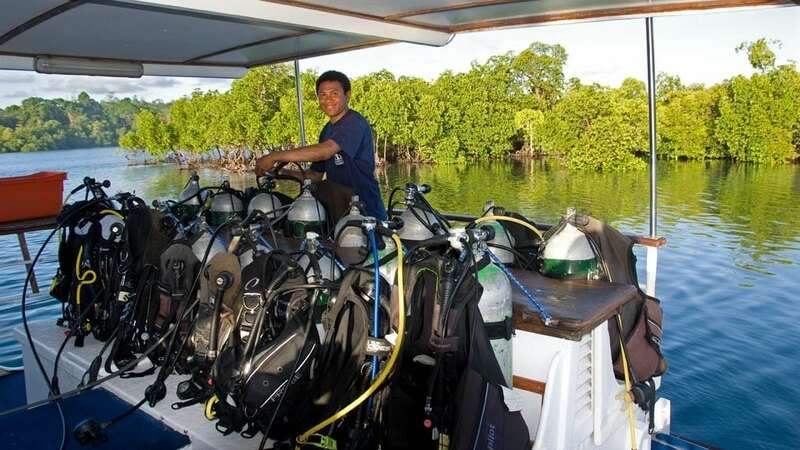 FeBrina is managed by Walindi Plantation Resort in West New Britain and run by an extremely professional and experienced team, and the daily routine allows up to 5 dives a day. 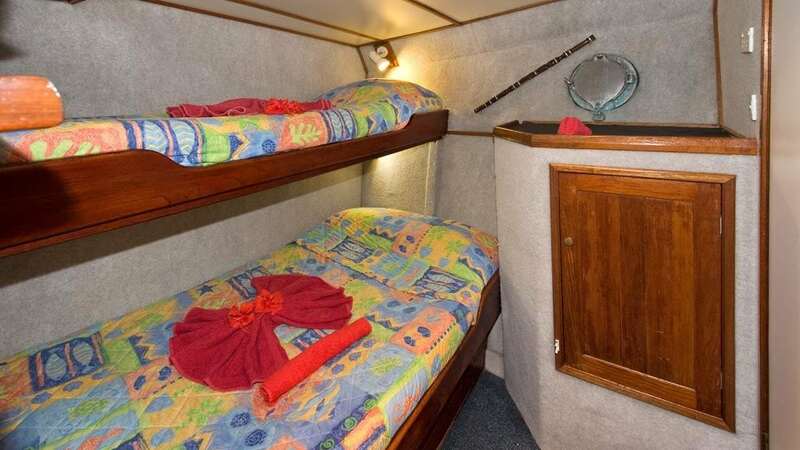 The 22m (72 ft.) long MV FeBrina is fully air-conditioned and accommodates up to 12 guests in single and double/twin cabins, all with en suite bathrooms & showers. All rooms have a wardrobe, mirror, hairdryer, soap, fresh towels daily, and a personal laundry daily. There is no sun deck with deck chairs per se, but there is a comfortable, shaded area on the dive deck and for sun-lovers, space on the bow. Owner’s Stateroom (#7) is on the Forward Dolphin Deck. 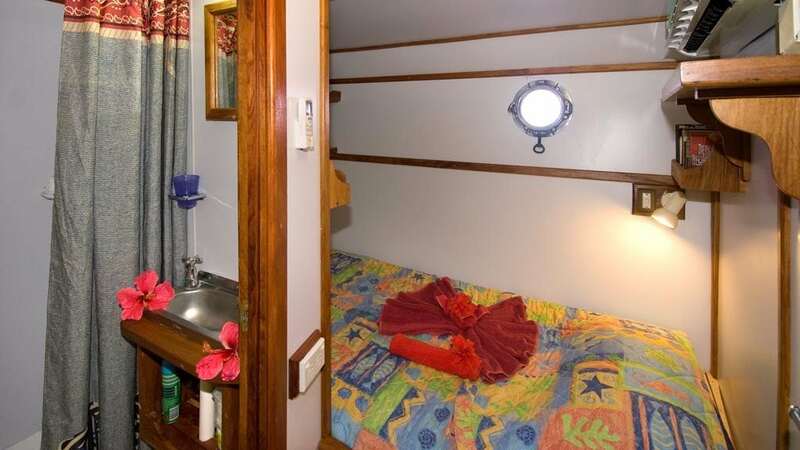 It is a large cabin with double bed and private facilities (shower and toilet are in two separate en suite rooms). 2 Deluxe Cabins (#5, #6) are also on the Forward Dolphin Deck. Each cabin has a small double bed with a single bunk above. 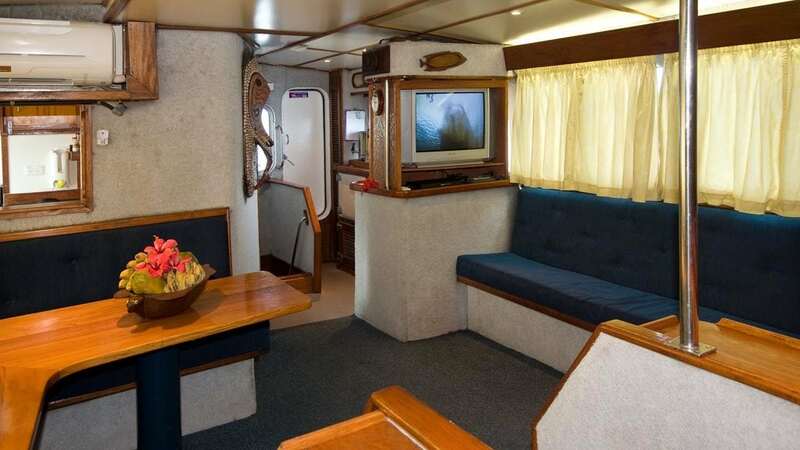 2 large Deluxe Twin Cabins (#3, #4) are on the Aft Dolphin Deck. Each cabin has a small double bed with a single bunk above at right angles to it. 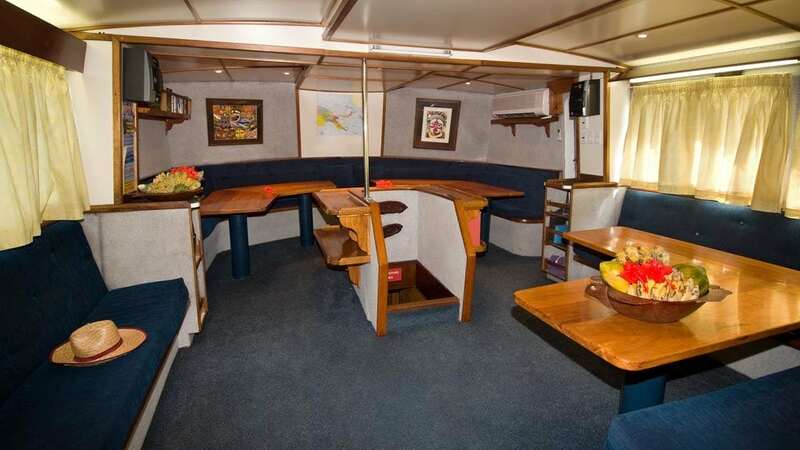 2 Single Cabins (#1, #2) are located at the Aft Dolphin Deck. 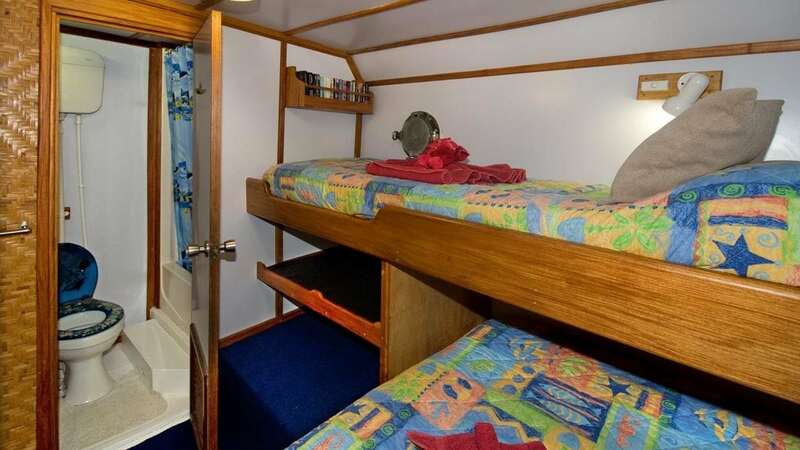 Each cabin has one large single bed and porthole view. 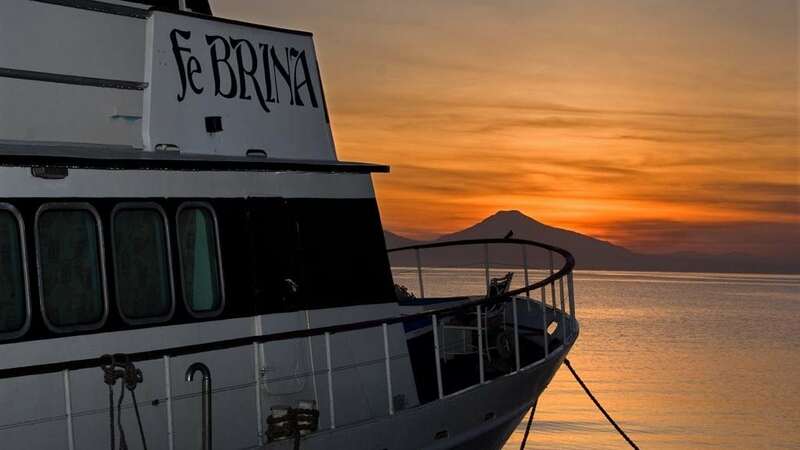 MV FeBrina’s usual Kimbe Bay itineraries depart from Walindi Resort, with occasional departures from Alotau and Rabaul for the Milne Bay itineraries. The daily routine aboard FeBrina allows up to 5 dives a day with an early morning dive, a late morning dive, an after lunch dive, an afternoon dive and a night dive. 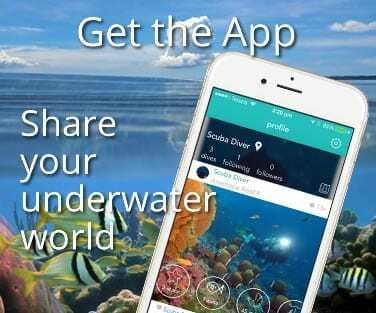 FeBrina’s dive deck provides easy access via the water level dive platform. A dinghy is used for some drift dives, and for the more inaccessible reefs. FeBrina is now well equipped for underwater photographers and videographers with a large camera table complete with shelves and 110V & 220V power outlets. Nitrox is available to Nitrox certified divers (additional charges apply). FeBrina has 10L aluminium tanks. FeBrina offers the unique combination of Walindi’s outstanding coral reef dives in Kimbe Bay with the excitement of diving in the deep clear waters of the Witu Islands and Fathers Reefs further offshore where pelagics are to be found. Whale, orca and dolphin encounters are not unusual in the area. 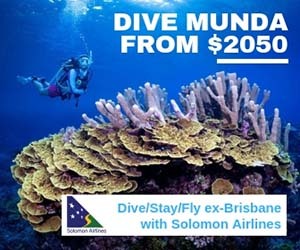 West New Britain is known for the huge range of giant soft coral species, the abundance of barrel and elephant sponges and the prolific marine life. 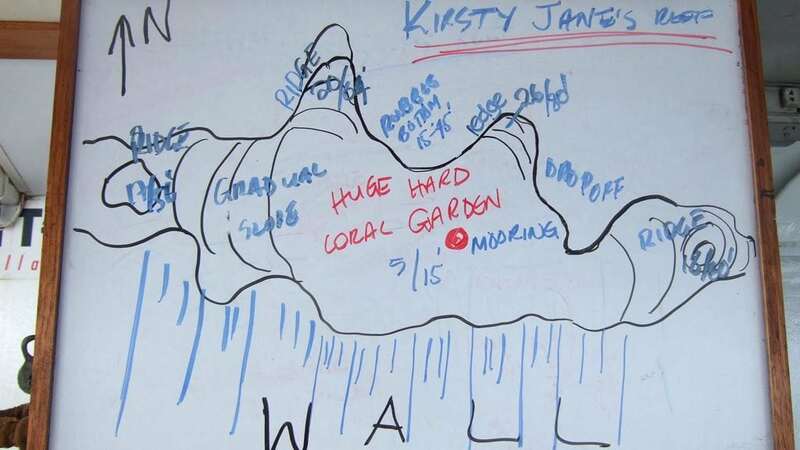 As it is relatively sheltered, coral can grow to enormous sizes in Kimbe Bay. Rabaul and the South Coast of New Britain are a critter lover’s heaven. White sand beaches and uninhabited tropical islands stretch along the southern coastline of New Britain Island. The rainforest comes right down to the water’s edge and the channels between the islands provide a number of drift dives. The experience and expertise of the dive crew and the skipper Alan Raabe are outstanding. 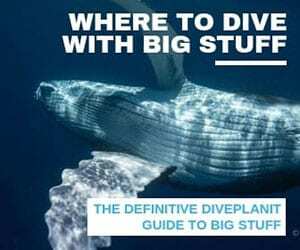 If you are on the hunt for that special fish, nudibranch or coral, Alan and his competent team of dive guides will go out of their way to make sure you see it. The variety of itineraries provide the opportunity to explore a number of different areas of PNG – and your first trip aboard the FeBrina will probably not be your last. Trip Dates & Availability – NB: Australian and New Zealand residents – please enquire re AUD pricing.